The year is 1900, and photographer Beatrix Spencer has just opened her studio to the public with high hopes for success. But it is a turbulent time to start a new business. A deadly outbreak of plague is threatening the city. Christa A. Ludlow has worked as a museum curator, research assistant, tour guide and lawyer. She has a Master of Arts (Writing) from the University of Technology, Sydney and lives in Sydney. I loved this book -a murder mystery centred around the Quarantine Station and the Rocks as the bubonic plague strikes Sydney at the turn of the 20th century. Not only did I I find the story line intriguing and couldn't put it down, but I also found it historically fascinating as it is meticulously researched and well-written. The strong female characters and their treatment at the hands of some of the male villains in the book also provides interesting social commentary. In 1900 Dr Rachel Benedict goes missing from Sydney Quarantine Station as plague threatens the city. Detective Fergus Blair, with the help of young photographer Beatrix Spencer, unearths a turn-of-the-century culture of corruption, violence and deception. Blair’s investigation turns up the horrific reality behind Dr Benedict’s murder and the disappearance of local children. 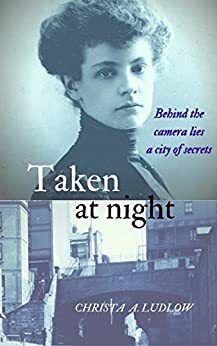 Like her heroine, author Christa Ludlow in her debut novel, ‘Taken At Night,’ turns a sensitive photographer’s eye on Sydney at the start of the twentieth century. This is crime fiction with a fascinating historical edge; secret harbour tunnels, the Suffragette movement, the Boer War, criminology, class politics and smuggled contraceptives. The novel is cleverly layered and suspenseful; a very compelling read. A thoroughly enjoyable journey through old Sydney. Christa Ludlow makes the city, its streets and characters come alive. This makes Taken at Night a particular pleasure for those who live or have visited Sydney, as we seek the older version of the city that Ms Ludlow describes in the modern city we know. But, the characters and the themes stand alone and can be enjoyed as a historical mystery, with a strong female lead. This novel, set at the dawn of the women's movement is a delightful step back in time. I'm looking forward to the sequel.